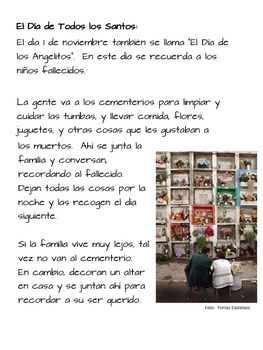 Day of the Dead packet-- a great way for older students to learn about Mexican culture! It is 100% in Spanish. It is appropriate for Spanish Immersion classes from 7th grade to adult and leveled classes: Advanced Spanish 2, Spanish 3 and above. 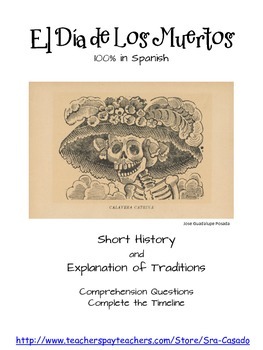 (please look at sample pages for an idea of the reading level required). Included is a 6 page text (with lots of great photographs!) 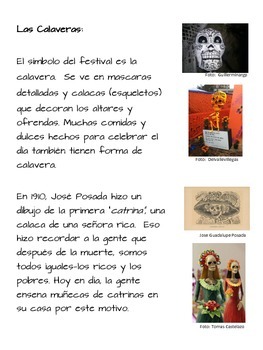 describing the history and traditions around Day of the Dead (El Dia de los Muertos). Additionally, I have included 1 page of comprehension questions and another page for the student to create a detailed timeline of the festival. Feel free to ask any questions! Thanks for looking! !